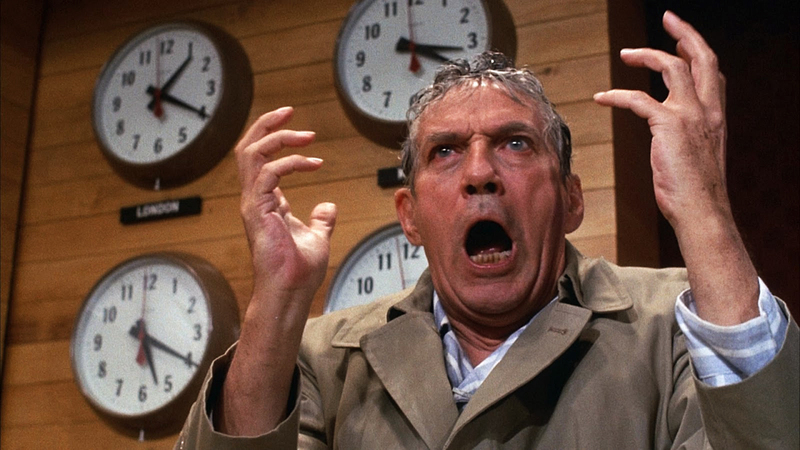 In 1976, Peter Finch donned the persona of a lifetime when he became crazed television news anchorman Howard Beale in Network. 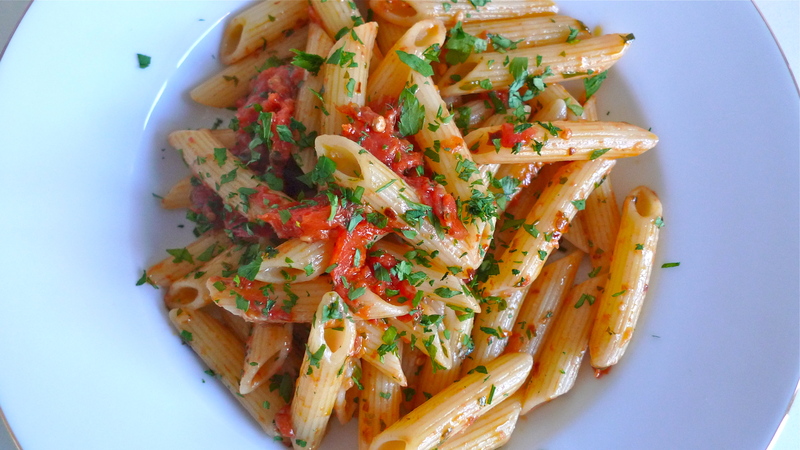 And, get even he did, plating a signature pasta dish of Rome suitable for what ailed Beale –the “Mad Prophet of the Airwaves” — Penne all’Arrabbiata (literally, really mad or angry). 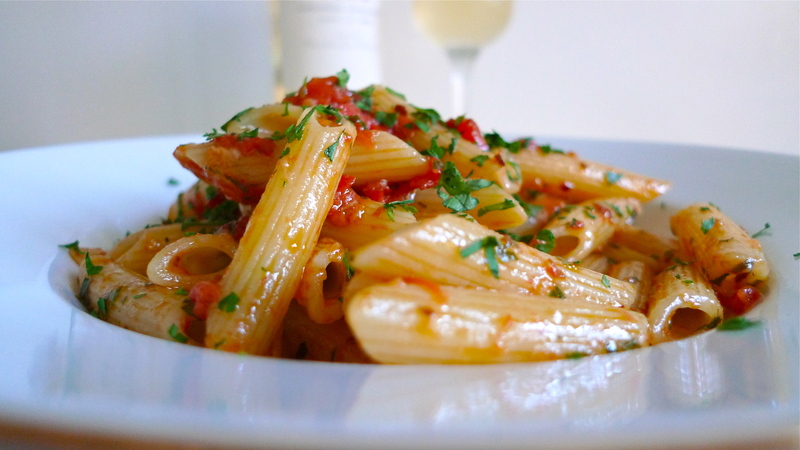 The madness or angriness– in the penne and not in the psyche of anchorman Beale — comes from the fresh or dried peperoncini (red-hot chili peppers) that’s in the sauce of this five-alarm pasta dish. I don’t have a specific wine-pairing attached to this red-hot recipe. 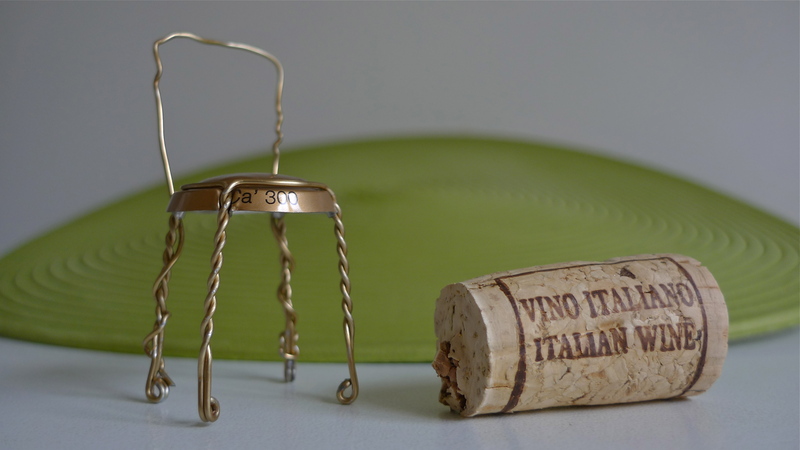 With all of the spiciness going on, your palate AND esophagus will appreciate a wine between 10-11% alcohol with a fruity bouquet and a light and refreshing taste in either red, white, rosé or sparkling. Now, if you’ll grab an apron and a fire extinguisher, let’s head into the galley and get this culinary madness underway. 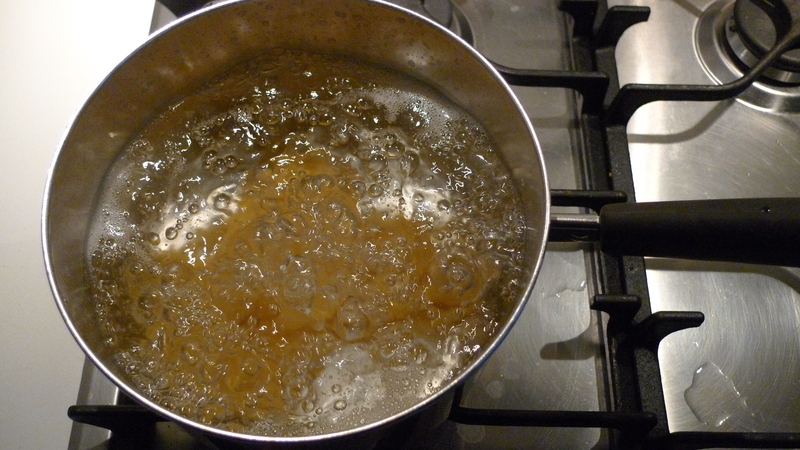 Step-1: Fill a medium-size pot with water, cover, fire heat to HIGH and bring to a boil. 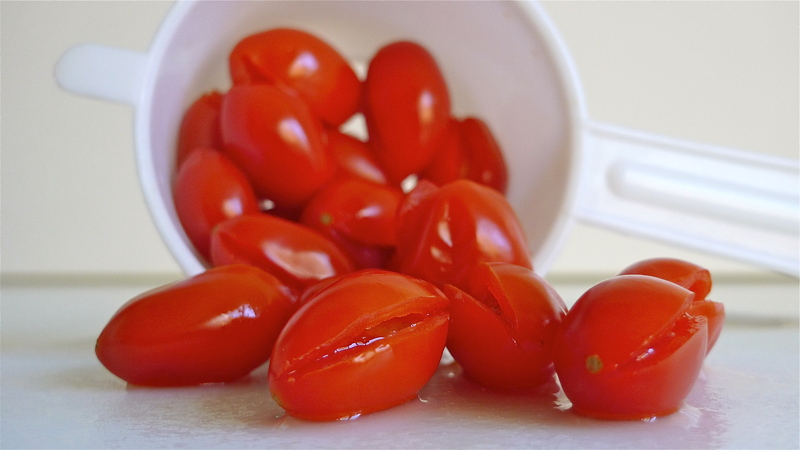 Step-2: Rinse-clean the tomatoes, score each then place in a small pot of water, bring to a boil and continue cooking for 1 min. 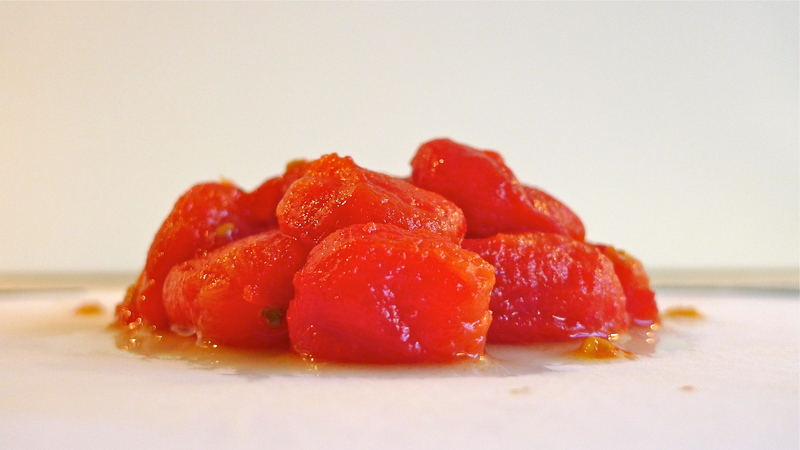 Step-3: Rinse, cool, peel then rough cut the tomatoes into small pieces. 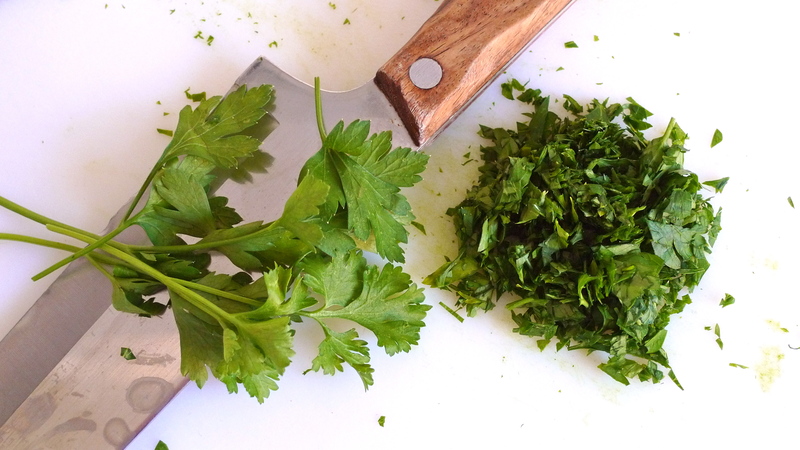 Step-4: Rinse, pat-dry then chop the parsley. 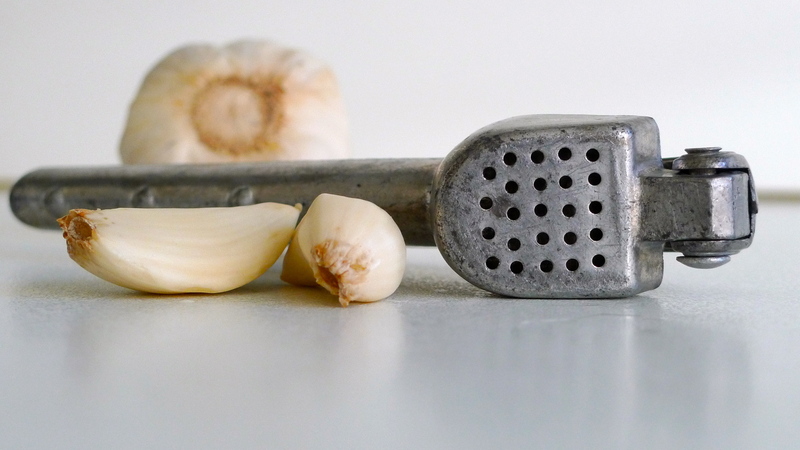 Step-5: Peel the garlic cloves and run them through a press. 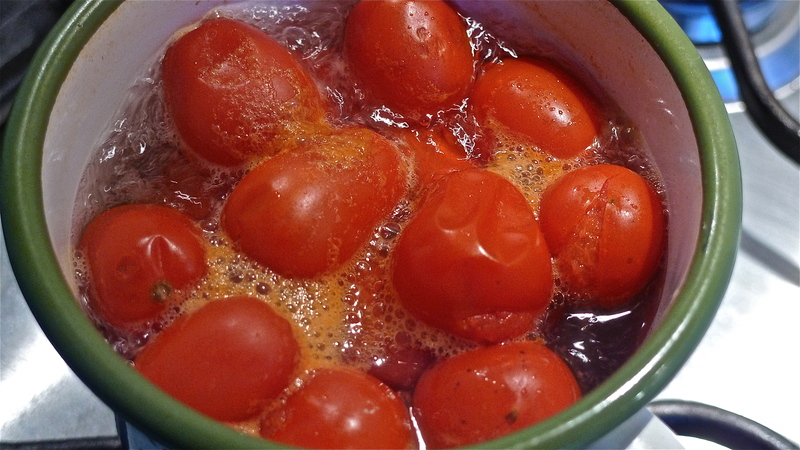 Step-6: Water is boiling. 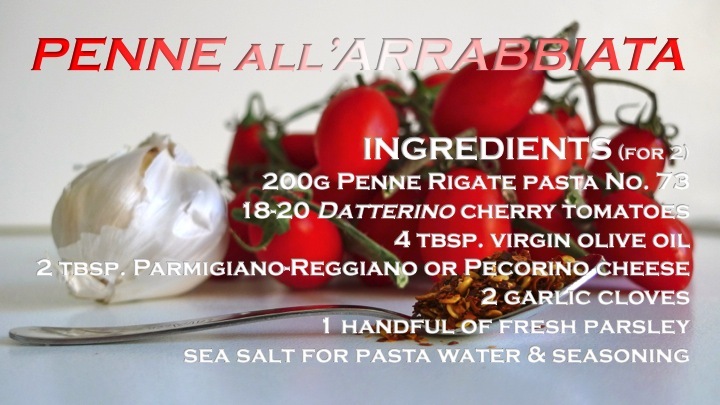 Uncover, add a handful of sea salt, and drop in the penne and cook for 10 min. 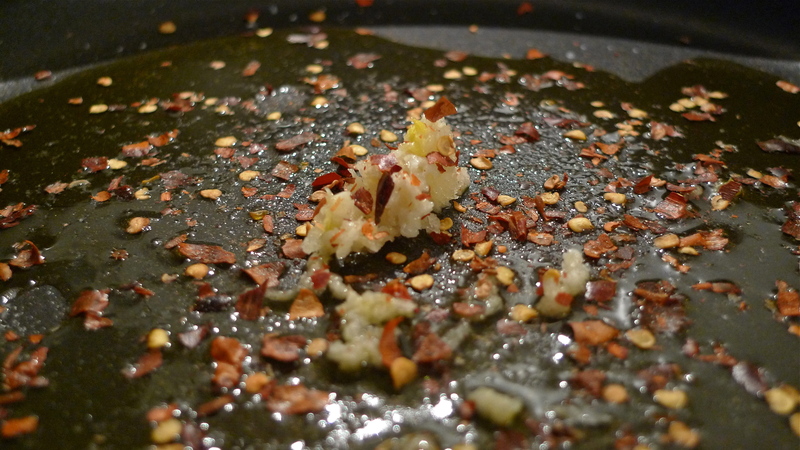 Step-7: In a deep skillet, add the olive oil, garlic and red pepper flakes, fire the heat to MEDIUM and let the ingredients cook for 2 min., or until the garlic turns paper-bag brown. 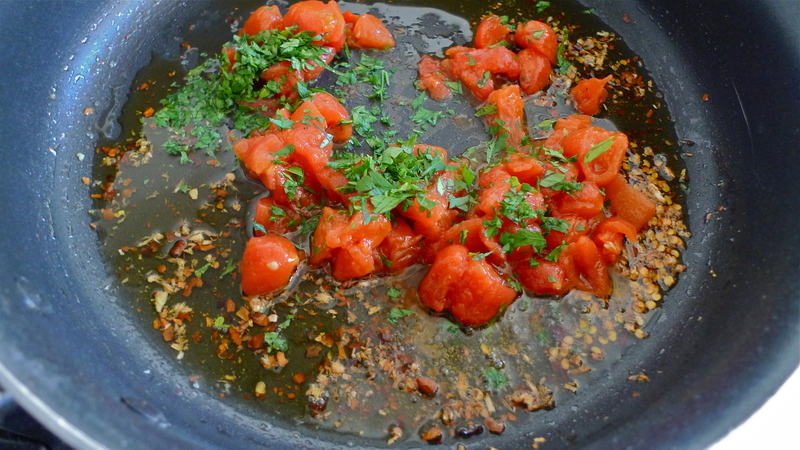 Step-8: Add the tomatoes, half the chopped parsley and a dash of sea salt, and cook for 3-4 min. Turn off heat and let the sauce relax. 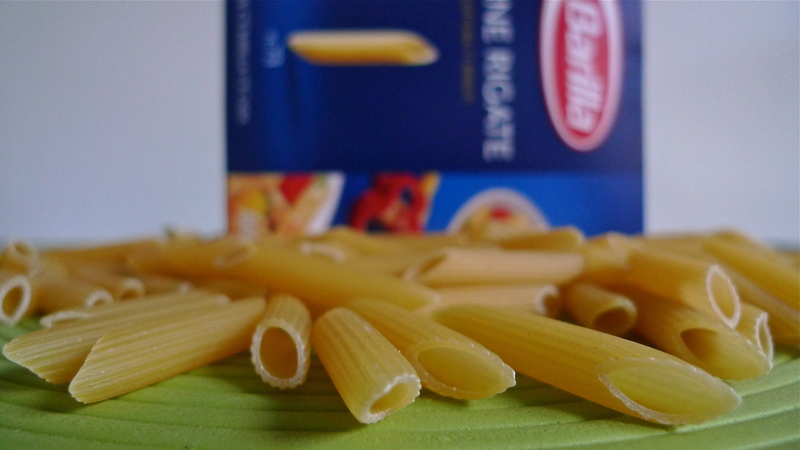 Step-9: The penne are ready. 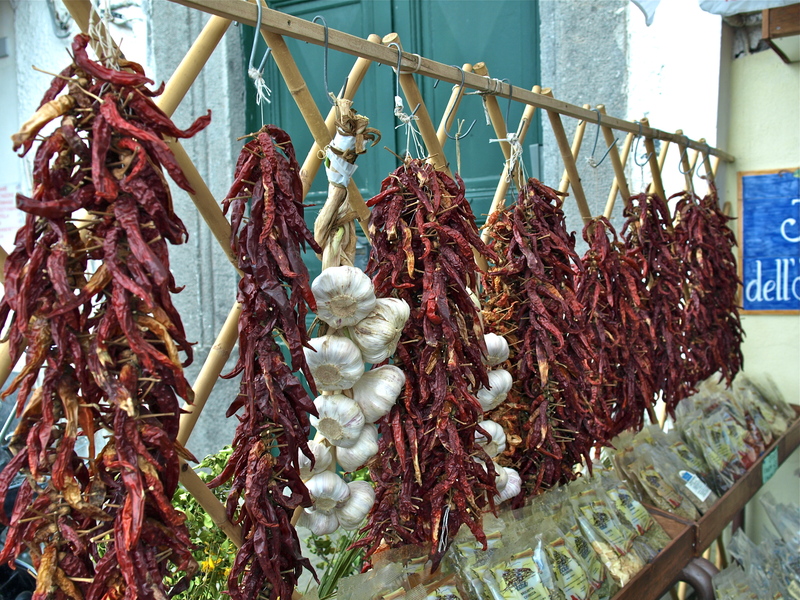 Turn off heat and drain and shake-dry the pasta. 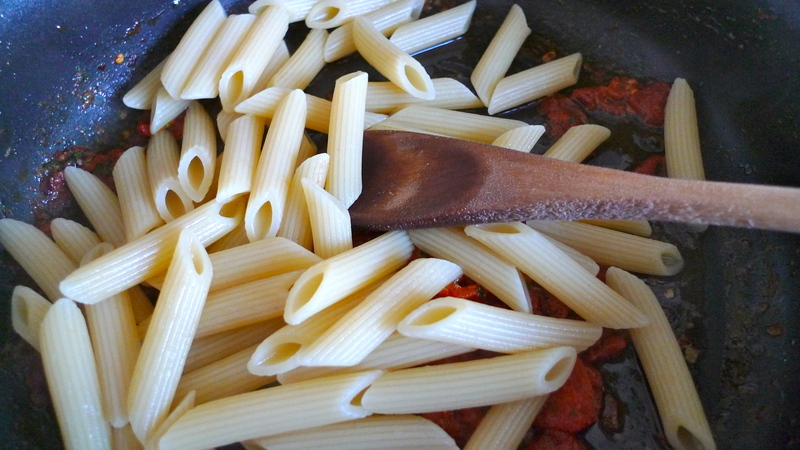 Step-10: Return the skillet to MEDIUM heat, add the pasta to the sauce and saute for 1 min. 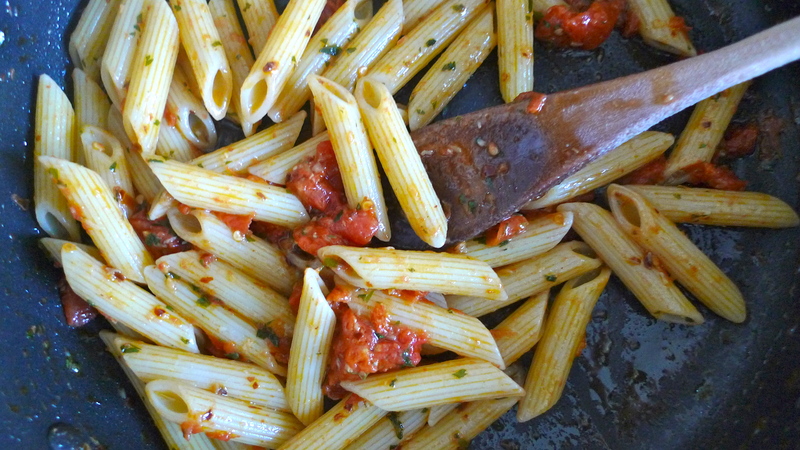 Step-11: Plate the penne, top with the remaining chopped parsley and optional cheese, then serve.